Kinda tough to tell because her skin is nearly the same color as her feathers but her back is still completely bare. Temps this morning were in the 30's and I just can't let poor Broody out in the cold half naked! So I switched things up a bit and made her a nice thick winter jacket using the same method as the thin apron. 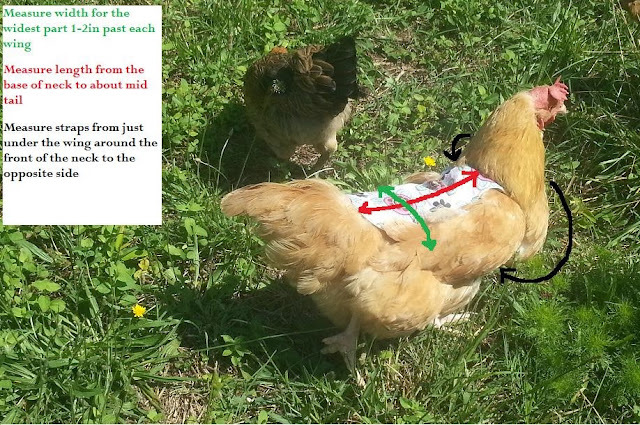 So whether you need to make a thick coat or a simple apron for your hen, this pattern will work! Broody is a full size Buff Orpington hen. If you are working with a bantum you will have different measurements and such. You will want the total length of your jacket to stretch from the base of her neck to about mid-tail. And when measuring for the width (have a helper handy!) lift the wings and measure about an inch or two past each side where the wings will cover. For Broody that was about 8in long and 6in wide. For the straps you will want to measure from under the wing by her chest to the other side of her neck. Now, you are going to need 2 of each. I have chosen fleece because it is warm and wicks away wetness. 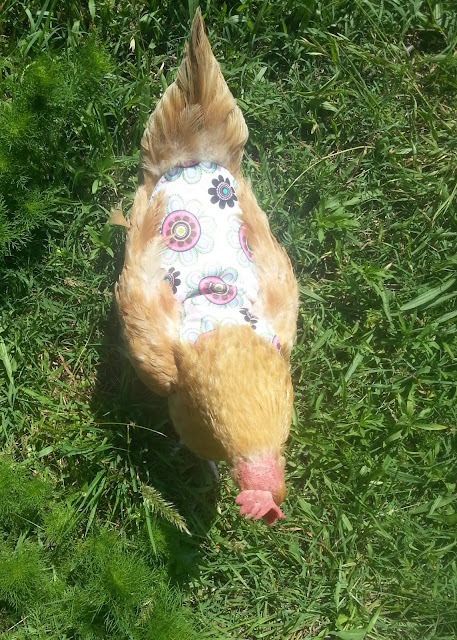 When I did the thinner apron I used a cute quilters fabric and backed it with an ugly but strong canvas so it was both cute but also strong so the rooster's nails and spurs wouldn't bother her. I do have cute colors and patterns for my fleece but I chose this color because it closely matches my bird and winter is coming and the places to hide from hawks are losing their leaves so I didn't want to put a big bulls-eye on Broody. Anyway, start with your jacket like this and work your way from one side to the other without closing up the top. After you have stitched all around, turn through the opening in the top and stuff if you are going to stuff. I lightly stuffed with some down from another bird we processed a while back. Gotta make use of all the parts right! Did you know that 7lbs of feathers in your compost pile = 1lb of nitrogen for your garden once composted! It also makes for super warm stuffing in a chicken jacket! After you lightly stuff (I am talking one handful of whatever you are using poly-fill, down, wool ect) then fold in the top so that the edge will be uniform with the rest after you top stitch. Then you will be ready to in your straps and top stitch all around. Depending on your material you will need to add the extra step of hemming your straps. I used fleece which does not require hemming so I did not hem my straps. I did fold them at the base where it connects but I didn't hem because I want them to be nice and wide across Broody's chest to keep her extra warm! Sidenote: you can also add a little loop of ribbon in between the straps so that your apron/jacket could double as a chicken harness that could be clipped to a leash! After you have top stitched if you are just making a simple apron then you can jump to adding on your fasteners. Or if you have added stuffing then you can get creative with quilting a bit. I did a simple criss-cross pattern after I spread the stuffing evenly around inside. Then I folded over the ends of my straps and hemmed there so that it would be double layer where I would be adding my snaps. This is to show how the straps will go. Lay yours out, look at it and make sure you put your snaps on the way you want them! And now for the snaps! You can use velcro or buttons here if you want instead. I enjoy the durability of snaps and I conveniently have a snap press so that is what I went with. Because these are wide straps I also did double snaps on each side but you can do one snap if your straps are less wide. If you do snaps you will need 4 caps and 2 of each inside pieces for the snaps. If you do double snaps (2 on each strap) then you will need 8 caps, 4 of each inside piece for the snaps. The take your cap and and poke the sharp end through. Decide if you need a male or female inner part for your snap (I did male parts for my straps and female parts for my apron) and line up the inner piece. Then put the cap into the black part of your snap press (be sure you have the right side, or it can make your snap not snap properly). Line things up and squish as hard as you can! Tada! Now do this to the other strap and then to the apron. You may or may not want to wait til sunset when your bird goes to roost so you can put it on her... or you can just chase her around for a while and hope to catch her! Take your time and lay it on her back, gently lift the wing so it lays over the coat, bring the strap around from the opposite side to they will criss-cross against her chest, snap the snaps and let her fluff herself out! Now your bird is nice and toasty or just has a good cover for when her rooster decides it's baby makin' time! I snatched Broody up this morning when she walked out of the coop and she was super warm with her new coat on! Now: if your birds already have feathers and you just think they might be cold this winter do not make your bird a coat. Broody got this coat because she has NO feathers. A fully feathered grown hen will grow in extra feathers for winter. Adding a supplemental heat via heat lamp or coat will prevent your bird from growing in that extra layer of feathers and will actually make her colder (if you take the coat off). I ended up making the straps on Broody's coat way too long... long enough to criss-cross in front and then tie in a bow on the back. I will shorten them on a day when it isn't too cold so she isn't without he coat for too long! This is both adorable and hilarious. Great we need them now!! !